“It tastes just like Grandma’s cooking.” Now imagine that feeling and flavor constructed by a tall, dark and handsome 40-year-old Parisian, Sephardic Algerian chef with willowy brown hair flipping out from under his backwards baseball cap. His name is Lionel Pigeard, but get it right, it’s pronounced the French way “Lee-Oh-Nel”, and he is the heart and soul of Palikao; a North African build-your-own couscous bar on the corner of 6th and Los Angeles. “Sometimes my passion is stronger than my knowledge. You have to be more passionate than talented as a chef,” Lionel says humbly through the kitchen windowsill as he chops onions for a caramelized marmalade. “I learn everyday. Sometimes I fail a recipe, but I try again and again and again until it’s perfect.” As a crowd of customers swarm in, and since his other chef Diego hasn’t shown up yet, Lionel hustles to the front of the house to build them beautiful bowls of couscous, with either homemade beef balls (his favorite item on the menu), seasoned chicken, lamb Merguez, or re-imagined matzo balls, with a rainbow of 8 different roasted vegetables and topped with a ladle of deliciously soothing broth. “Do you want something spicy?” he smirks before spooning on his homemade red or green, almost hard to handle, Harissa. The $10-$13 bowls are placed on rustic silver trays and paired with your drink of choice. Palikao’s chalkboard menu is an ode to his old French restaurant ‘La Cantoche’, which is a slang word for school. Lionel’s mother was a teacher, so their theme celebrated her, and was affordably decorated with her classroom items, toys and drawings. The simplistic industrial design by French couple ‘Advanced Sunrise‘ lays ground for rope-bound shelves holding potted green foliage and crisp white Chinese lanterns hanging from the ceiling. 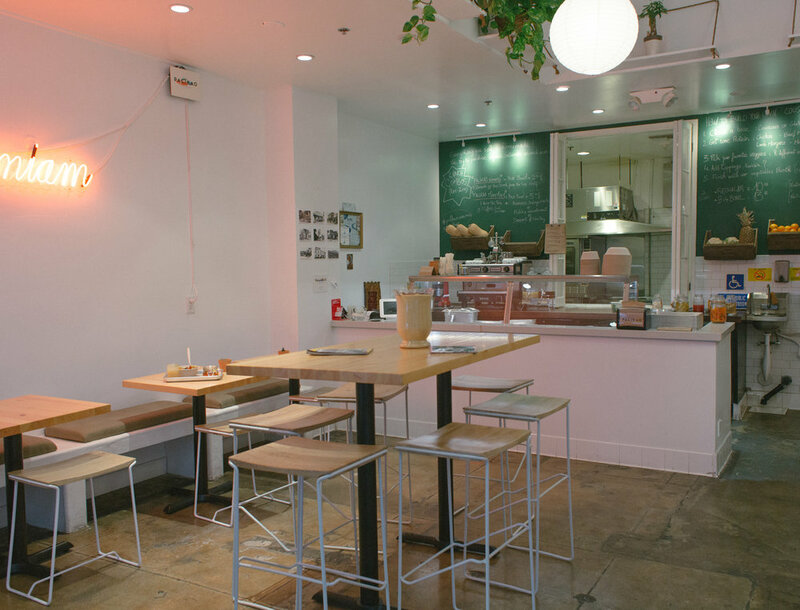 “I really wanted to step aside from the very traditional style of couscous … I just wanted to focus on the produce and the vegetables.” But besides this seemingly Californian motif, the 4x6 prints hanging on the wall hold incredible sentiment. “Pictures of my Grandma in Algeria, that’s what’s important to me, “ Lionel explains their history. “Couscous from Algeria is something else. It’s the whole dish, not just a side or a grain. 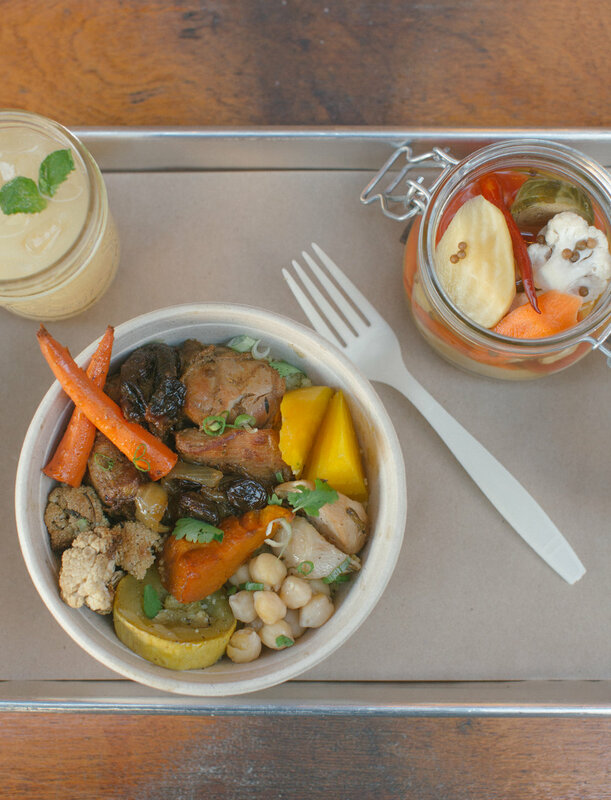 My grandmother’s and my mother’s couscous style was chicken with squash,” he says.